No animals were hurt in the making of this Halloween murder scene. 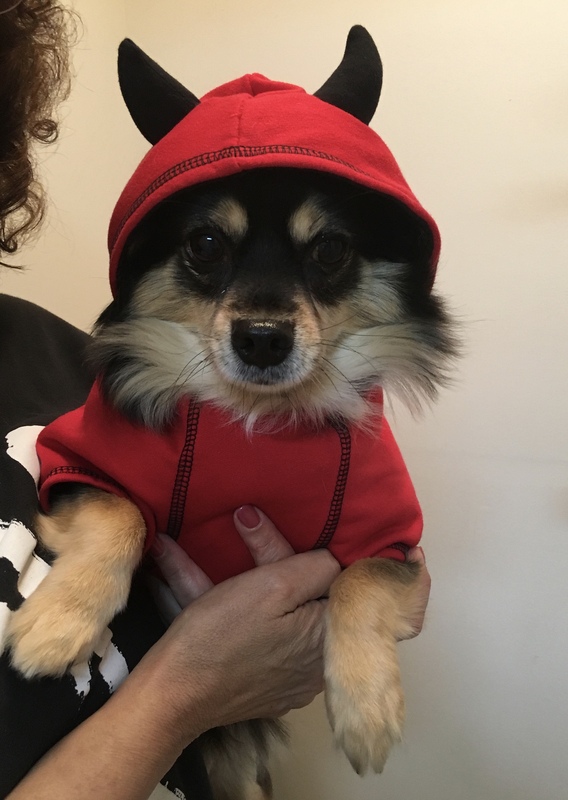 We have so much fun at Halloween. Maybe because it is just a fun time, no need to cook and bake and worry about family or presents or going to visit people. Here at the zoo, we love the fall and everything that comes with it. Though it is the dying off of the crops and the going to sleep of the plants and the earth, it is a magic time for us. We really enjoy being wrapped in layers and having a crackling fire to warm our bones. Though the cold has started to affect us all, because we are not puppies anymore, it still holds a freshness that makes us feel alive. Harvest time makes me feel thankful for having food on my table and being able to provide for my family; flesh and fur and fins. Have you heard about the Teal Pumpkin Project? It helps raise awareness for people who have food allergies (like me) so that everyone can partake in Halloween. Have you ever thought about the child with peanut or milk allergies who can’t participate? Please think about having toys or alternative treats. If you want more information about the Teal Pumpkin Project go to FARE – Food Allergy Research & Education. 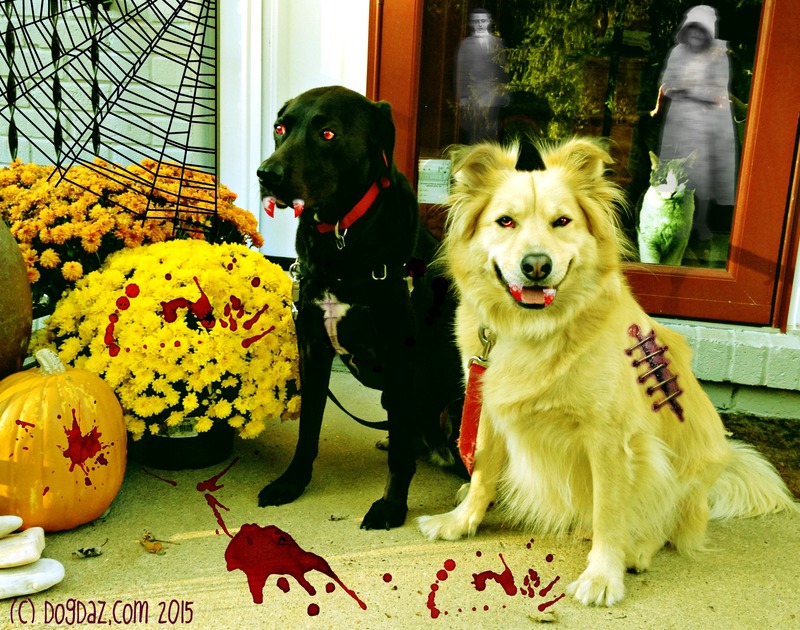 We give out eyeballs and spiders and other fun things in a separate bucket from regular candy. I give the goblins a choice when they come to the door. We are ready for mischief – Are you? Black and White Sunday: Boo!! 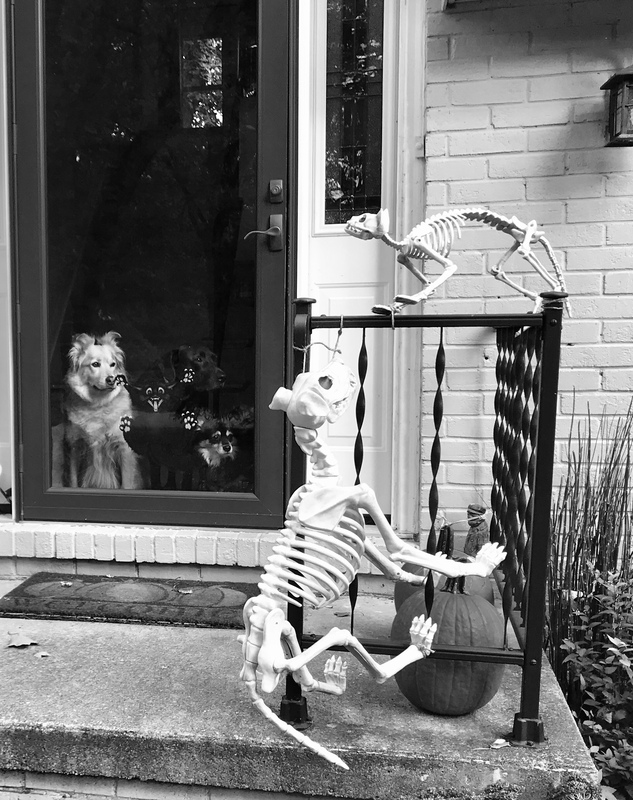 The trio looking soulfully at the skeletons on the railing. Is this what happens to bad dogs and cats? 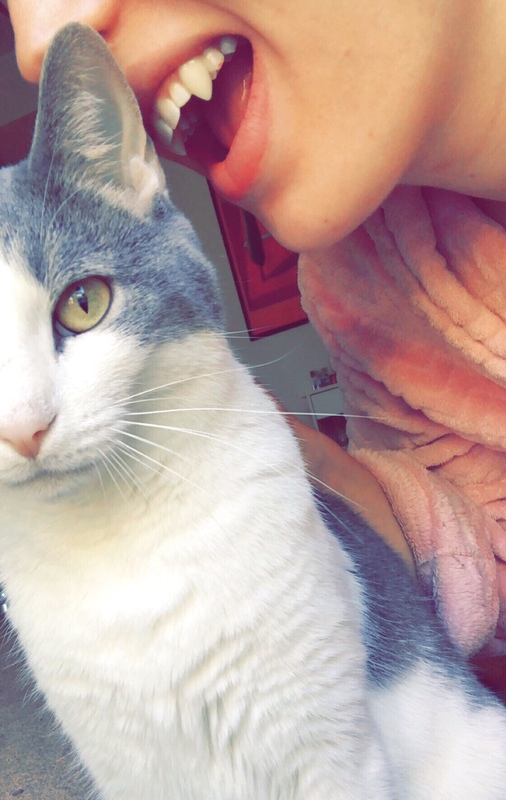 Is this what happens if Mommy doesn’t feed us for a few days? I am not sure I like these zoomies on my doorstep. 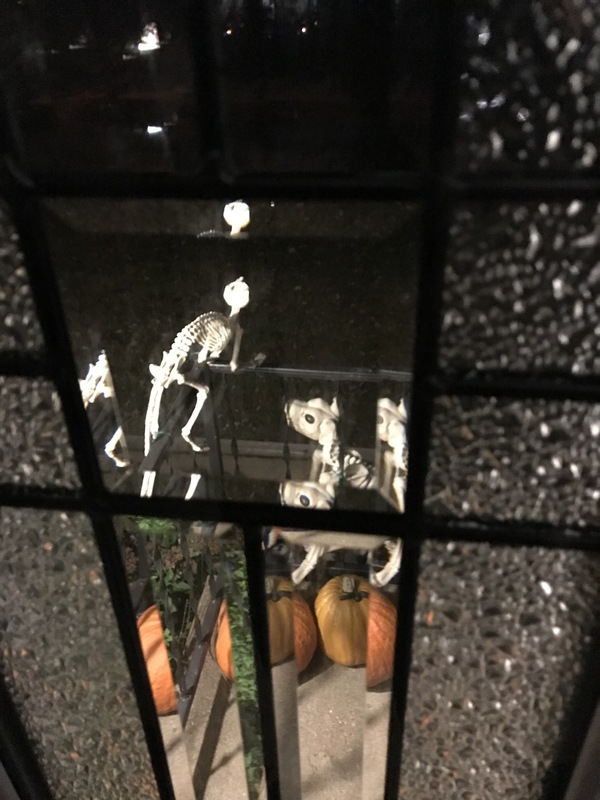 What spooky decorations are you doing this year? Have a wonderful Black and White Sunday. Keeping 3 dogs quiet when people keep coming up to the front door of the house is a major feat. (Keeping Sofie quite, ever, is a big job.) 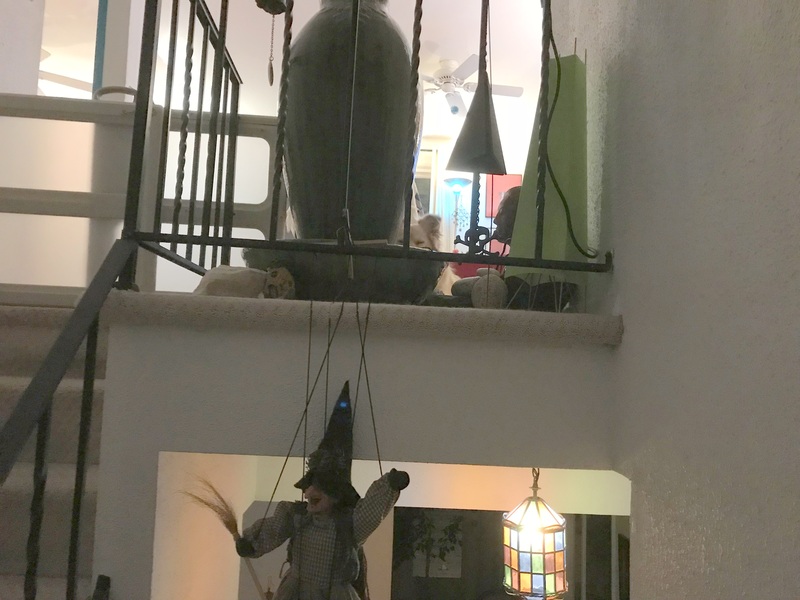 I put the ‘baby’ gate at the top of the stairs to keep them away from the door, but they still can look over the ledge and watch the action. Charles actually came through the bars (like the cats do) on the side. I guess I will have to block that section too next year. You can see Sofie hiding behind the fountain watching me. 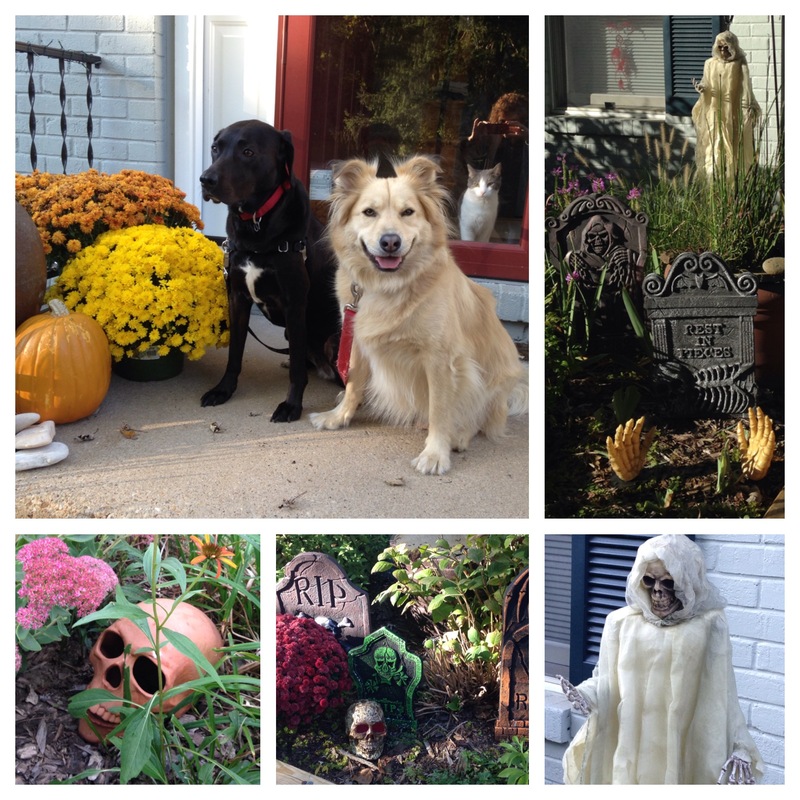 I am sure it doesn’t help that the skeleton dog and cat are outside the front windows. Looking out the side windows which have prism glass, I would bark too. Charles, the Mugwump, here. I need to talk to you about the trouble I am having with my humans. Being so adorable, as I am, and only 15 lbs., everyone wants to dress me up. 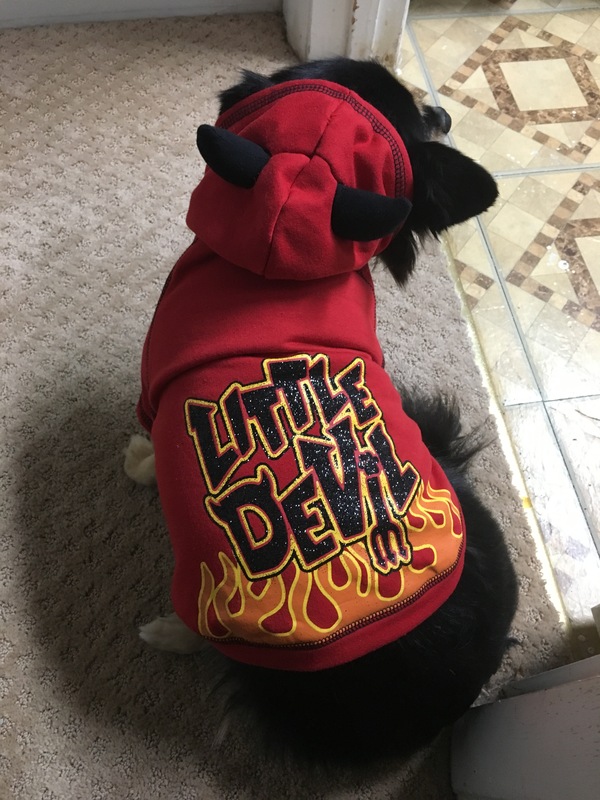 Case in point, this little devil costume that Peanut bought me for Halloween. Now, I am not complaining (too much) because I get tons of attention that the other dogs don’t (because I look so darn cute)…. but REALLY… the Devil? Shouldn’t she have made me “Conan the Barbarian” or some other superhero? 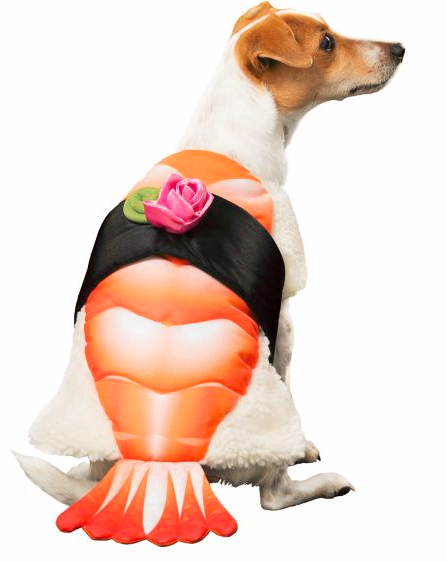 Mom says she had to talk Peanut out of turning me into ‘sushi’ for Halloween. Oh well. I guess the Devil isn’t that bad after all. Zombie Nine and the Ghoul Girls! It’s a new rock band. 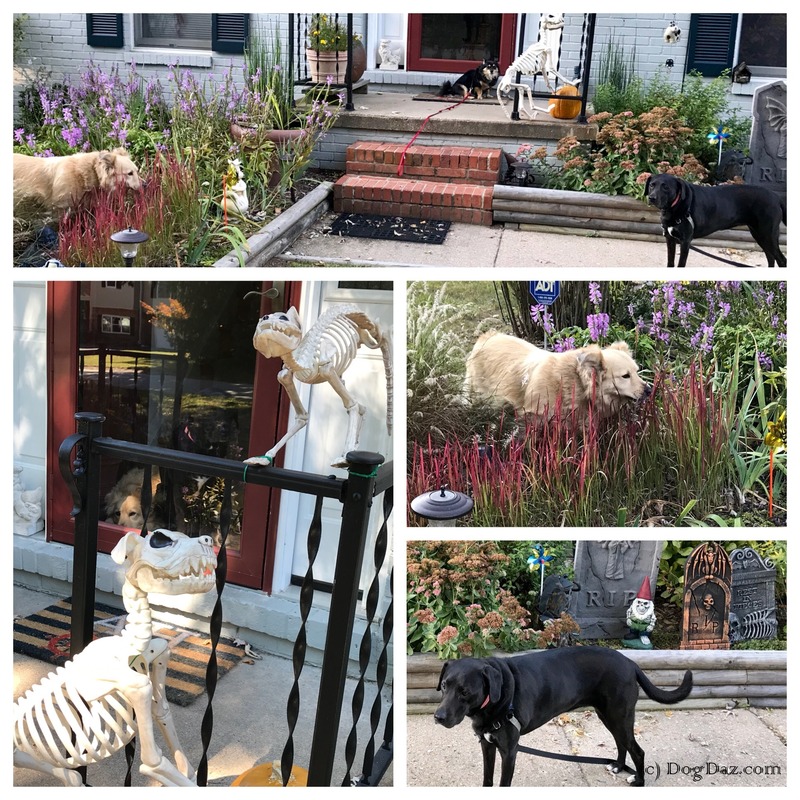 Mom has started her Halloween decorating. She is debating whether she needs to buy more skeleton dogs because there are 3 of us. What do you think? We think she has enough scary stuff already. Do you know the name of the plant that Sofie is chewing on? It’s called ‘BLOOD GRASS.’ Ha Ha Ha Ha. It is invasive and will soon take over everything if we let it. Sort of like us. We animals at the DogDaz Zoo sure take over everything. And that’s the way we like it. More decor to come as the month rolls on.